A month ago I did a piece on 10 great beers available here in Manitoba. It turned out to be one of my most popular articles I've ever done, so I decided it was time to do a sequel. As a beer geek in Manitoba, finding great beer has been fairly difficult, but with more people accepting stronger tasting beers, breweries and the Liquormart are bringing out new beers every few weeks to keep beer geeks happy. Sam Adams Spring Lager - This is also known as Alpine Spring Lager in the United States. This is my favourite patio-style beer. It has a combination of a great witbier and Boston Lager in one bottle. It's citrusy, a bit malty and neither too light or too strong in flavour. This is one of my favourites by Boston Beer Company. This is a seasonal so it will come and go quickly. Available for $2.06 for a 355mL bottle. Drink this on the patio with friends. Red Racer Extra Special Bitter (ESB) - This is another hoppy and citrusy treat. This one is a rarity to Manitoba as it comes and goes quite quickly. It has a bit of a grapefruit taste and aroma, good amount of sweetness. I always wish I bought more of this whenever I do get my hands on a can. This is one of Central City Brewing's crown jewels. Costs $2.50 for a 355mL can. Also, the ESB won Gold at the World Beer Cup in the ESB category. Can't go wrong! Half Pints Tasters Pack - While this is not one beer per sé, this is a collection of beers. The Half Pints' Tasters Pack is fairly easy to find in Manitoba, at Liquormarts and at hotel/motel vendors. The collection includes 3 bottles (each) of St James Pale Ale, Little Scrapper India Pale Ale, Bulldog Amber Ale and Stir Stick Stout. This is a great selection of beers if you have company over and want to try something different. There is a beer in there that I guarantee will please even the fussiest beer drinker! Costs $21 before taxes. Unibroue Blonde de Chambly - This one is a BRAND NEW permanent fixture in Manitoba. The Blonde de Chambly by Unibroue is a saison-style wheat ale that has a very drinkable citrusy taste. If you are looking for a beer for the patio, this is a great partner. I recommend savouring this while barbecuing steak or burgers in the summer. Costs $5.40 before tax for a 750mL bottle. Jacob Bruin - This Belgian dubbel is a bit pricey for most tastes, but well worth every cent if you are looking for a great Belgian ale to treat yourself. It is $10 for a 750mL bottle. It's a great sweet Belgian ale that has a bit of flavour that I can only describe as: a bit of whisky, red wine, Trois Pistoles and a slight roastiness. Delirium Tremens - A beer that was until recently banned in much of Canada, Delirium Tremens is yet another great Belgian ale. The flavour is similar in ways to Unibroue's La Fin du Monde and comes in a nice ceramic bottle. Costs just under $4 for a 330mL bottle. If that's a bit pricey to you, there's always Unibroue's La Fin du Monde for $5.40. Brooklyn Lager - Summer will be here soon and we will be looking for lighter beers that quench our thirsts while on the patio. Brooklyn Brewing's Lager is a great combination of thirst quenching and great flavour. If you are expecting a light golden lager, you may be disappointed as this is quite a hoppy and citrusy beer, even for a lager. The lager costs $2.87. Also give their East India Pale Ale a try! 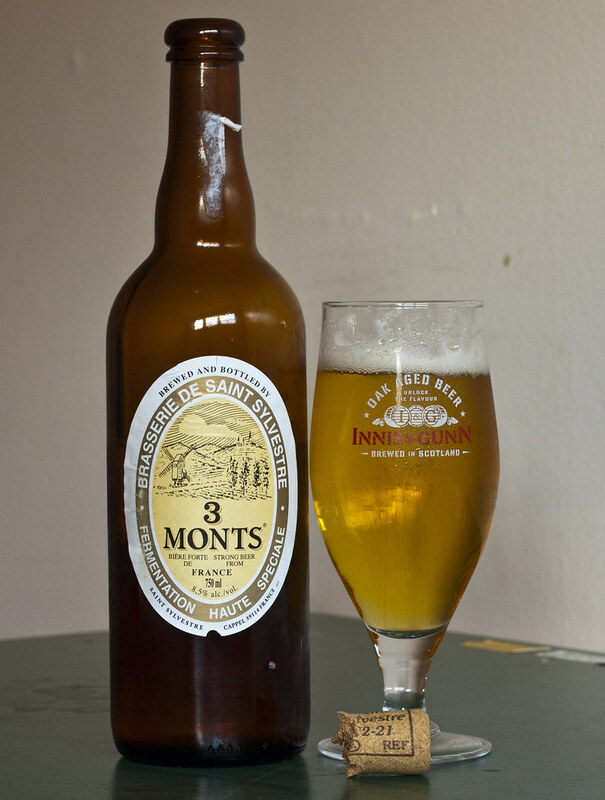 3 Monts - If you are looking for a bit of a celebration beer for toasting, for example - New Years Eve or a job promotion, this is a great choice. It's quite similar to DeuS Brut des Flandres, which is a champagne-style Belgian-French ale. Quite sweet, oddly nutty, very carbonated and aged in wooden barrels. It's only $6 or so for a 750mL corked bottle - cheaper than DeuS, which is over $20 per bottle. I call this the poor man's DeuS, but it is still an enjoyable champagne-style beer. Russell Brewing's A Wee Angry Scotch - Last beer for this edition of Ten great beers available in Manitoba. Are you a fan of a caramelly beer? I know I am! Russell's A Wee Angry Scotch is a great caramel & scotch ale that just happens to be a great alternative to sweet oak ales such as Innis & Gunn. I recommend this as a dessert beverage, or while reading your favourite book (or newspaper). It is sold for $5.18 for a 650mL bottle. What should you stay away from? Coors Light Iced T. Have a great spring/summer!